Interest in the life of legendary inventor Nikola Tesla has seen a tremendous resurgence in the past two decades. And with good reason. The man was a genius who was able to take so many of the ideas swirling around in the 19th century ether and turn them into fantastic new inventions — both real and imagined. Tesla's wondrous imagination made him quite the futurist and here at the Paleofuture blog we've looked at some of his remarkably prescient predictions over the past few years. But the 21st century's rather fashionable interest in Tesla has had some disturbing side effects. Specifically, people want to canonize the man (sometimes literally) and turn his personal and professional struggles into a sort of morality tale involving clearly delineated characters: some ostensibly good and others ostensibly evil. Tesla boosters of the 21st century will tell you that Tesla was the embodiment of all that is good in the world — Matthew Inman of the Oatmeal did just that in one of his more recent comics, "Why Nikola Tesla was the greatest geek who ever lived." They'll tell you that Tesla's struggles against professional adversaries like Thomas Edison and George Westinghouse (both of whom Tesla worked for at various points in his life) were the most pure examples of good versus evil. This past year, people have been crowdfunding museums and films and any number of other events in an attempt to raise Tesla's profile and are constantly couching his work in moralistic terms. But I hope that with this renewed excitement for the life's work of a great inventor people don't lose sight of one thing: he was a brilliant man, but he was just a man. Like any man, Tesla was far from perfect and sometimes had very warped ideas about how the world should operate. 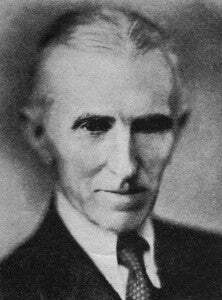 One of Tesla's most disturbing ideas was his belief in using eugenics to purify the human race. In the 1930s, Tesla expressed his belief that the forced sterilization of criminals and the mentally ill — which was occurring in some European countries (most disturbingly Nazi Germany) and in many states in the U.S. — wasn't going far enough. He believed that by the year 2100 eugenics would be "universally established" as a system of weeding out undesirable people from the population. The year 2100 will see eugenics universally established. In past ages, the law governing the survival of the fittest roughly weeded out the less desirable strains. Then man's new sense of pity began to interfere with the ruthless workings of nature. As a result, we continue to keep alive and to breed the unfit. The only method compatible with our notions of civilization and the race is to prevent the breeding of the unfit by sterilization and the deliberate guidance of the mating instinct. Several European countries and a number of states of the American Union sterilize the criminal and the insane. This is not sufficient. The trend of opinion among eugenists is that we must make marriage more difficult. Certainly no one who is not a desirable parent should be permitted to produce progeny. A century from now it will no more occur to a normal person to mate with a person eugenically unfit than to marry a habitual criminal. The ideas behind eugenics would become substantially less popular after World War II, for obvious reasons. I doubt that Tesla understood the scope of the atrocities that were being committed in Europe (and at the hands of the California eugenics movement) at the time. But again, his ideas were clear: the world should be rid of so-called undesirables. However unpleasant the idea of eugenics is to reasonable people on its surface, this notion seems particularly strange coming from a man like Tesla, whose own mental illnesses would have likely put him in the "undesirable" category under any authoritarian regime. The inventor may have been brilliant, but his warped views on the future of the population reveals that in the end, he was still just human. The Mad Scientist Hall Of Fame: Nikola Tesla!